Turn up the intensity of your workouts with the ultimate low sugar, high performance pre workout energy drink. Energy Charge is scientifically formulated to give you fast and sustained energy release from simple and complex carbohydrates, including agave – nature’s lowest GI sugar – and long-chain maltodextrin. To put more horsepower under the hood, Energy Charge contains a host of micronutrients in a patented blend, including creatine, AAKG, B-vitamins, zinc and green coffee. Numerous scientific studies have shown that each ingredient in Energy Charge is highly effective on its own. But when put together into one supplement, in the exact quantities we’ve used, you get a super charged performance enhancer unlike any other. Developed with James Cracknell, the double gold Olympic medalist, Energy Charge is designed for endurance athletes, especially men, who want to power up their training and racing, by delaying fatigue, boosting energy levels and improving muscle function. 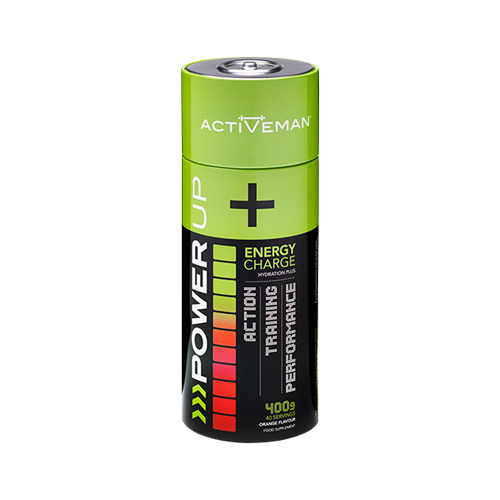 Activeman Energy Charge is a high performance pre workout drink, engineered by Bio-Synergy and James Cracknell to help take your training to the next level. The patented formula starts with simple carbohydrates to give you an instant energy lift but without the sugar spike and crash, with the addition of complex carbs like maltodextrin to keep you charged for longer. Energy Charge also contains magnesium to reduce fatigue, boost energy levels, improve muscle function and protein absorption. You also get a power dose of AAKG, which increases nitric oxide levels to improve blood flow to muscles and protein synthesis, both of which allow you to train harder for longer. Iron has numerous benefits including improving energy, flow of oxygen, reduction in fatigue and even brain function. Energy Charge also contains D-Aspartic Acid, a natural ingredient that is particularly good for men over 30 as it assists in boosting testosterone and energy levels. Beta Alanine is an amino acid, which adds to your aerobic and anaerobic performance, making it ideal for both endurance and strength training. As you can see, Energy Charge is packed full of micronutrients that are designed to boost your energy levels, powering you to a PB performance. Activeman was developed alongside Olympic gold-medallist, James Cracknell. IS ENERGY CHARGE® RIGHT FOR YOU? If you’re an endurance sportsman – runner, triathlete, rower, cyclist or adventurer – then yes, it is. Whether you’re at the front or back of the pack, you can up your performance in a big way with the power of Energy Charge behind you. As you’ve read above, our formula is bursting with ingredients that are designed to help get the best out of your body. Energy Charge is especially good for men over 30, who could use a lift in testosterone levels to boost their energy levels. While you can use Energy Charge for all your workouts, we think it’s a must-have for your important training sessions and races. You’ll find a wide range of options from Bio-Synergy, including our pre-workout and energy powders such as Insanity, BCAA Powder, Matcha Green Tea Powder, Activeman Oatein and many others. We’ve sourced the finest quality nutrients to achieve a premium quality content that is hard to match. As with all products made by Bio-Synergy, Energy Charge is produced right here in the UK, so you know you’re getting the finest quality supplements. Fructose, Maltodextrin, Agave Powder, Flavouring, Calcium Carbonate, Creapure® Creatine Monohydrate, Green Coffee 50% Standardised Extract, Citric Acid, Beta Carotene, Magnesium Oxide, Arginine Alpha Keto Glutarate, D-Aspartic Acid, L-Citrulline Malate, Beta Alanine, Ferrous Fumarate, Zinc Citrate, Copper Citrate, Pyridoxine Hydrochloride, Cyanocobalamin preparation, Cholecalciferol preparation. Add 1 serving (1x 10g scoop) to 250-300ml of water or juice and drink before you excercise. "This is a really great pre workout drink. Not too highly caffeinated like some, with some great slower release sugars so you don’t peak. Perfect pre training or pre race drink. This is a really great pre workout drink. Not too highly caffeinated like some, with some great slower release sugars so you don’t peak. Perfect pre training or pre race drink."